Reaching Isola Verde in only 45 minutes? With our hydrofoils in service to Ischia it’s possible: High Speed Crafts of last generation bring you from Naples to Casamicciola in forty-five minutes; the ferries depart daily from Beverello dock and are in service all year round. Ischia hydrofoils are all modern and safe and offer you a series of on-board services to make your trip even more comfortable and pleasant. 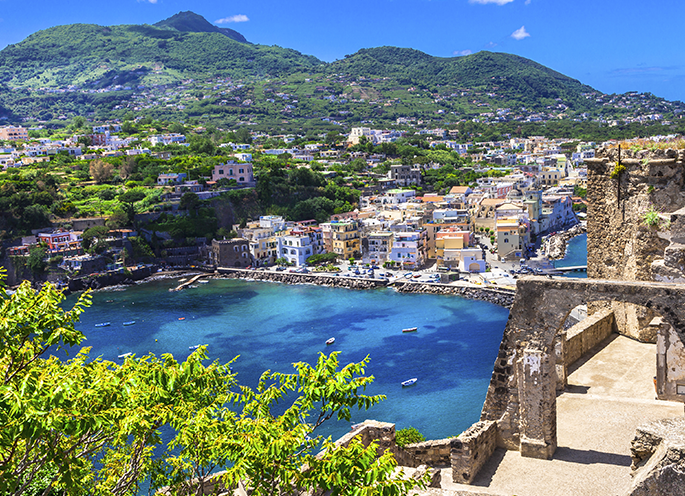 Moreover, on Ischia connections, SNAV offers discounts and price reductions to students, groups, families and commuters. Save time by booking your tickets online: don’t miss out on all the opportunities that Snav reserved for you. SNAV hydrofoils will lead you at the discovery of Ischia, the biggest island of the Golf of Naples. Loved and celebrated by artists and poets, it is the ideal destination for those who wish to spend their holidays in a place rich of marvellous landscapes and entertainment options. The island proposes a perfect mix of beaches (Citara, San Francesco, Maronti, Mandra, Carta Romana), trendy locations (the village of Sant’Angelo, Poseidon garden, San Montano bay), natural beauties (the fumaroles of Maronti and Sorgeto, excursions on mount Epomeo, the “Fungo” of Lacco Ameno), monuments and historical-artistic testimonies (the Aragonese Castle, Chiesa del Soccorso in Forio, Torre di Michelangelo). The island of Ischia is really around the corner: hurry to discover its beauties thanks to SNAV hydrofoils.